Mercer County, PA. U.S. Census TIGER/Line map. Mercer County, Pennsylvania, bordering Ohio, in 1956 had two Amish (one now Mennonite) settlements. The Old Order Amish settlement northwest of Jackson Center, consisting of 109 baptized members in 1956, began in 1942 when Jacob J. Byler with his four brothers and families moved there from Atlantic, in Crawford County. Other families left Atlantic for the Jackson Center settlement because of the munitions plant established two miles from Atlantic. Eli K. Byler of Geauga County, Ohio, served as their first bishop. In 1956 the bishop was Henry M. Miller. For an account of the Mennonites (MC) near Hadley in the same county, see Maple Grove Mennonite Church. Hostetler, John A. "Mercer County (Pennsylvania, USA)." Global Anabaptist Mennonite Encyclopedia Online. 1957. Web. 25 Apr 2019. http://gameo.org/index.php?title=Mercer_County_(Pennsylvania,_USA)&oldid=113516. Hostetler, John A. (1957). Mercer County (Pennsylvania, USA). Global Anabaptist Mennonite Encyclopedia Online. 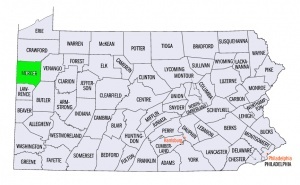 Retrieved 25 April 2019, from http://gameo.org/index.php?title=Mercer_County_(Pennsylvania,_USA)&oldid=113516. Adapted by permission of Herald Press, Harrisonburg, Virginia, from Mennonite Encyclopedia, Vol. 3, p. 655. All rights reserved.